From those tendencies, in the second century, the classes of the “abstinent” men and women emerged in every local church, which activated the particular gifts of chastity, abstinence and ascesis concerning the devotional life of Christian community. There were, of course, some extreme tendencies concerning those spiritual quests, but the general principle of avoiding any show – off or boasting regarding austere ascesis was always in force. In general, the enthusiasm for the profession of faith led many believers to the excessive and extreme tendency of seeking martyrdom, a fact that resulted to the quest of new forms of ascetic ideal. Quetism was, since the middle of the third century, the most important expression of those quests and entailed the retreat of believers with special gifts from the Christian community to nearby or distant deserts, in order untrammeled to be devoted to the spiritual struggle of ascesis. While the retreat from the Christian community was reprehended as denial of Christ for the world during the period of persecutions, in quetism it was praised as denial of the world for Christ. Leaving the world wasn’t retreat from temptations as well, since carnal thoughts are, basically, a spiritual alienation and not deviation of the flesh from the Christian’ right spiritual experience. The example of Christ’s retreat to the desert, in order to conquer Satan’s temptations was the exceptional paradigm for those who wished to achieve the best possible mimesis of Christ’s polity and to master their personal temptations. In that sense the exercitants placed greater emphasis on the inner spiritual temptations and identified mortal sins with the heavier sins of thought. From Quetism sprang Monasticism. 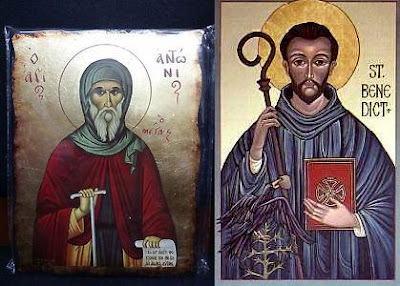 A link of the two spiritual quests was the ascetic life of Antonios the Great, the most famous hermit in the beginning of the fourth century. Antonios the Great was born around 250 in Koma, Memphis, from a prosperous Christian family. Even when he was a child he showed great zeal concerning regular participation in the Mass, and he had memorized the entire New Testament. After his father’s death at the age of 20, Antonios the Great retreated to a cave in the desert in Middle Egypt and lived an austere ascetic life for 25 continuous years. Imitating the previous hermits, he himself became a paradigm for many others, who imitated him and went to live in the desert during the last decades of the third century. The rumors for his ascetic deeds were spread all around Egypt and were a basic motive for the quietists to go to the desert (hermits). Antonios the Great left the old cave, due to its been surrounded by many hermits, and went to an unknown area of the desert, in order to avoid temptation of ascetic pride. The new area was near the sea and offered him ideal circumstances for his ascetic life. Antonios the Great died in 355 at the age of 105 leaving behind an eternal example of ascesis and consistent spiritual life. Therefore he was rightly characterized as “teacher of the desert”. From the tendencies to organize ascetic life sprang the Monastic system of ascesis. Its introducer was the hermit Pachomios, a student of Palaemonas, who had realized the monks’ practical difficulties. When he left Palaemonas, Pachomios became a hermit at the east river bank of the Nile, where founded Lavra and applied the first rules of the Monastic system. Similar Lavras he founded in other places as well, which functioned with the same rules. The rules of the Monastic system solved the basic devotional and practical problems of the desert hermits, but at the same time they co – ordinated the hermits regarding a particular programme of ascesis. Those monks, spread at the Cells and the Lavras, had a common morning prayer, common participation in the programmed works of the community, uniform apparels, common incomes and expenses, common meals and common programmes of ascesis, without abolishing the special gifts. The monks’ uniform clothes were a simple kirtle, with or without sleeves and belt, white ship skin with wool, coniform cover for the head and the neck, linen over – coat for the shoulders and shoes. The monks’ uniform clothes were being made in the Monasteries. The monks’ food was dictated by the austere rules of fasting and the frugality of ascesis and its basis was bread made of vegetal or other materials allowed during fasting. For the days that fasting wasn’t obligatory, they had fish, oil and wine. Animal or bird meat was rare, while meals often comprised milk, cheese and eggs. The great hermits, of course, subjected themselves to more austere tests with less variety of food. The enthusiastic recognition of the Monastic life on the part of the church modeled two understandable tendencies. The first came from the local church and was seeking a more organic incorporation of Monasticism into the spiritual life of the local church and presented as necessary the indissoluble unity of the spiritual experience of the local ecclesiastic body. The second tendency came from Monasticism and was seeking its enforcement on the local church connecting the claim for supremacy of the ascetic experience with the claim for coordination of the clergy and the people of the local church under the principles of Monasticism. The problem was that the distinction between those two tendencies wasn’t discernable, since the common criterion in both cases was their relationship to the local church. A characteristic extreme case were the Eustathians. Their inspirer was Eustathios, who came from Sevastia, Asia Minor, and he had been a hermit and was consecrated an elder. He was very enthusiastic and tried to enforce the principles of the Egyptian Monastic life on all clerics and the believers, before the middle of the fourth century. Just like the “abstinents” of the first centuries, he obliged the adherents to abstain from marriage and meat eating. The Eustathians contemned the married clerics and all the mysteries they performed. In spite of the extremities of the adherents of Eustathios regarding his teaching, many Christians followed him. In order to fight the group of Eustathios the local synod was held in Gaggra of Paflagonia. The case of Eustathians proved that there were always believers who were willing to follow extreme ideas and teaching. Another example of extremity were the Messalians or Massalians, who appeared in Mesopotamia in the middle of the fourth century. Basically, they were a conservative ascetic move, whose basic rule was continual praying and enthusiastic dances, avoiding ecclesiastical worship and the Mysteries. In order to avoid similar cases, the Fourth Ecumenical Synod with its decision placed the Monasteries under the spiritual supervision of the local bishop. That decision limited the incontrollable activities of the monks. The foundation of Monasteries was now legal only if the agreed opinion of the relevant bishop was given. In the west, Monastic life was spread in the fourth century from the east. Athanasios the Great during the period of his exiles to the west and the orthodox bishops of the west during their exiles to the east spread the ideals of eastern Monastic life in the west. The reorganization of western Monastic life came mostly from the ascetic ideals of Kassianos and was realized by Saint Benedict, the founder of the order of Benedicts. Saint Benedict, after ascetic itinerancy in various places, adopted the Monastic ideal and lived as hermit. The fame of his austere life was spread very fast in the Monasteries of the area. He was elected superior at a Monastery at Vikovaro. However, the discontent of the monks due to the superior’s austerity, made him return to ascetic life. Benedict went to Monte Cassino of Campania, where he founded a new Monastery, in which he applied the austere rules of the Monastic system. When he died, he left a thriving Monastery at Monte Cassino and the Canon for Monastic asceticism, which he himself had written. Saint Benedict’s Canon was the main source western for the western Monastic life in the begging of the Monastic system. The Canon presents the Monastery as a family, the father of which is the abbot. The monks have to hold very strictly to their Monastic promises, to constantly pray, to actively participate in the Monastery’s labour, to obey the abbot willingly, to read the Holy Bible and to make efforts for the spiritual perfection. Saint Benedict’s Canon was spread all over the west and strengthened the development of Monastic life, particularly in those countries that accepted the Christian dogma after the fourth century. From the ninth century the monks were divided into small and great. The first lessened the austerity of Monastic life. The latter were wearing around their chest a cloth with cross and certain letters. Apart from them, there were order kinds of monks, such as the pillar saints, who were living an a pillar, those who were living on a tree, in caves, those chained with chains etc. Since the ancient centers of Monastic life, such us Egypt and Syria, passed under the predominance of the Arabs, new centers were developed, where Monastic life thrived and those centers were Constantinople, Olympos of Bythinia and Athos. Monastic life, at that time, thrived on Mount Athos, where the Monasteries of Xenophon (11th century), Pantokrator and Koutloumousiou were founded in the time of Alexios and Manuel Comnenos; also the Monasteries of Chalantariou, Esfigmenou, Simonos Petra and Dionysiou (14th century) were founded. To those Monasteries belonged other smaller ones, the Skites. The Holy Mountain was, independent, ecclesiastically and politically it was under the command of the emperor. Every Monastery was managed by the abbot, who was elected by the monks and was lifelong. Apart from other distinctive features of the monks on Mount Athos a peculiar system arose, according to which every monk determines all by himself his way of life, he eats and sleeps in his cell and receives from the Monasteries whatever he needs for his preservation. That system became known in the 14th century and the monks started to acquire property. The negative was that a relaxation of the Monastic life was observed, for they were free concerning quality and the quantity of food. The monks of the Monasteries were eating the same food at a common table and they had all in common. On Mount Athos lived, apart from Greek monks, Russians, Serbs, Bulgarians, and Georgians as well. The Monasteries were rich and that affluence was coming from the donations of emperors and other leaders and thus they had landed property outside Mount Athos. They had rich libraries and many monks were distinguished for their education and their spiritual eradiation, which was felt not only in Byzantium but also in many Orthodox countries. The monks were distinguished and are still being distinguished for their devotion to Orthodoxy.